Bingara Central School primary captains Jane Newnham, left, and Clayton Brien, Principal Brooke Wall, Northern Tablelands MP Adam Marshall with secondary captains Katie Dennis and Jaqueline Coombs at the official opening of the upgraded court. 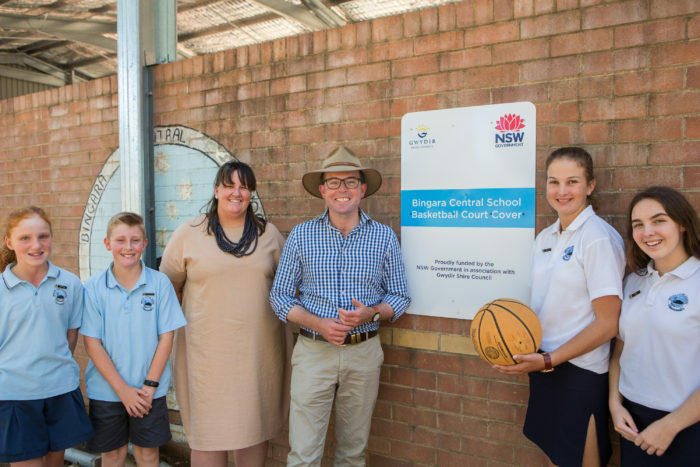 BINGARA Central School students and members of the local community will now be slam dunking in the shade, with a $113,734 NSW Government-funded upgrade of the basketball court, including an all-weather cover and lighting, now complete. Member for Northern Tablelands Adam Marshall visited the school last week to inspect the finished basketball court with Principal Brooke Wall and Gwydir Shire Council representatives. Mr Marshall said the project had seen new line markings, lighting and a shade structure for the school’s multi-purpose courts. “Bingara Central School’s courts are among the better facilities in the town, but some major works were needed to turn them into a high-grade space for the entire community,” Mr Marshall said. “The $113,734 grant from the NSW Government’s Stronger Country Communities Fund helped erect a large steel shade structure, resurface and mark the court for a wider variety of sports, and added lighting for the first time. “I’d like to commend Gwydir Shire Council for its $17,680 contribution and the school’s P&C for a very generous $6,000 to help this important project go ahead. “With these upgrades now completed, students and the public can play basketball, netball and volleyball in rain and shine, day and night on a brand new court. “This will help provide much more opportunities for young people across the Gwydir Shire to take up healthy pastimes, particularly for young women, who have traditionally faced limited sporting options. Principal Brooke Wall said the NSW Government-funded upgrade would be a great asset for the town. “The collaboration between the Gwydir Shire, Bingara Central School and our P & C to upgrade our facilities for the benefit of the students will be felt for a long time,” Mrs Wall said. “The upgrade provides a space for our students and the community in all sorts of weather to participate in a wide variety of sports and hopefully enhance community sporting events within Bingara.